Okay. First time at Warwick Folk Festival. Can’t remember what made us pick this one to do earlier in the year, but back in January it seemed like a good idea. We’d booked Broadstairs and were looking for something different. And it’s a very different festival to Broadstairs. For those of you who don’t know, the Broadstairs Folk Week is a big festival at the seaside in the middle of August. Camping is all at the big senior school about a mile from the sea front, and the venues are scattered around the town. It’s like Edinburgh as a University – accommodation here, lectures here, here, and here. Warwick, on the other hand, is all on one site. It’s a campus university, everything’s within walking distance. And that includes the beer festival! Some of the acts at Warwick we’d seen before. Okay, one of the acts we’d seen before – Granny’s Attic. But their ABBA tribute act was new to us! That might need a bit of explaining. One of Warwick’s “One Unique Things” (quick 13th Age reference there) is their non-folk session. Each year it’s themed, last year was The Beatles, apparently, and this year a dozen or more acts covered ABBA songs. This session was supposed to last for an hour. I think it was nearly 2 by the time it finished! It was compered by one of my favourite acts of the weekend – Keith Donnelly. Wherever you turned at the festival, Keith was there. He finished the Friday night concert on the open-air stage. He performed several shows for kids. He hosted the ABBA gig! He performed at and compered the final concert of the festival itself. The man’s a genius. Les Barker, performance poet, introduced us to a number of ridiculous little poems, including one most of the audience knew about the iceberg that sank the Titanic. A common theme running through Keith Donnelly’s work was poking fun at “Show of Hands”. We’d never heard of them, but when they were headlining the Saturday night concert, we figured we’d check them out. Wow! Just incredible. And they had to come on after Korontzi had rocked the hall with some incredible accordion and tambourine playing from the Basque country. You had to be there. And my award for the “band to watch” goes to Man the Lifeboats. Superb folk/rock from London. Everything’s on one site. You can stroll from your tent to the food, the stalls, the concerts, everything. 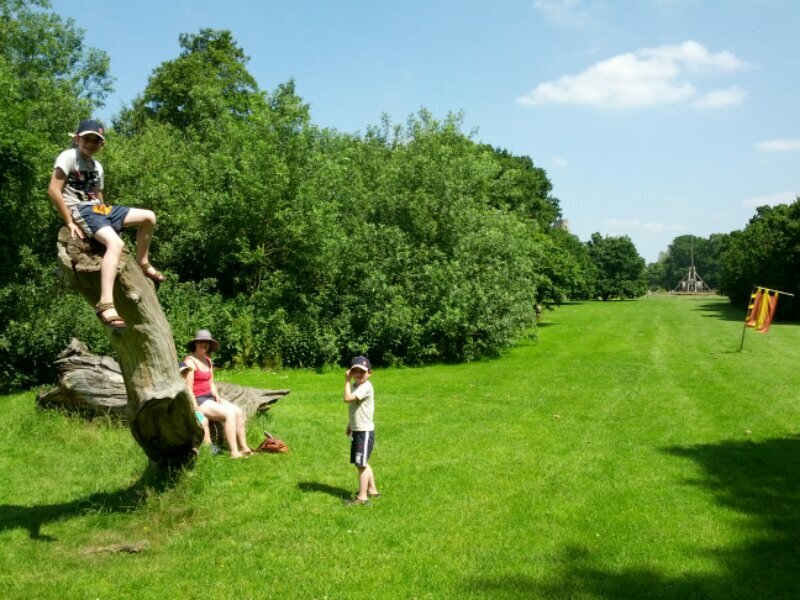 Plus we were in the neighbourhood for my brother-in-law and some friends from Uni so got to do some wild swimming in the Avon, had a cracking lunch at the Cottage of Content, and a picnic in the park. The food was incredibly good – so easy for festivals to be lazy and get some so-so trucks in but the Old Granary Pierogi set the bar damn high and everyone else upped their game to meet. Leon’s vegan food was amazing. And the beer… the cider… Over a dozen ciders, 30+ real ales! Fantastic. The acts were great – a huge range of styles and genres. A whole host of stuff new to us. Brilliant. There’s a lot of clashes in the programme – 2PM every day there’s 3 different concerts in 3 different venues, and a ceilidh in the hall. Likewise at 8PM. You’ve really got to prioritise who and what you want to see/do. Broadstairs seem to have it covered where the ceilidh finishes then, giving you just enough time to amble up to the marquee for the afternoon concert… Just haven’t noticed the clashes in the schedule. Massively underrated, your Morris dancing. Massively. I leave you with the Black Swan Rapper. Are we going back to Warwick? As you may know, I’ve got five kids. Five. That can make taking them places somewhat tricky as the activities on offer have to be suitable for everyone from ages 4 to 14. And as anyone with a teenager knows, keeping them entertained and preventing them from being a happiness-devouring pit of despair is very, very, important indeed. So, without further preamble, here are 5 things that you can do with your kids in Yorkshire. Actually, I say “without further preamble” but I should clarify that this is “Yorkshire” as in “The Yorkshire Mostly of My Childhood”. So Ripon, Masham, that sort of place, with occasional forays further afield to York and beyond to the coast. Get out and run around a lot. Seriously, this is Yorkshire. There’s a lot of it. And most of it is moorland. There’s a spot not too far from Masham, goes by the name of Druid’s Temple. It’s a folly, nothing to do with Druids (for further information, see Professor Herring’s wonderful book “You’re not a druid, you work in accounts.”) but it’s set on the edge of the moors, has miles of pathways to run around, you can play a fantastic game of hide and seek, take your dog, and finish up at Brymoors’ Ice Cream Parlour for a triple scoop pot with white chocolate sauce. And that’s definitely a big, shouty, adventurous, “SCIENCE!” just like they’d use it in Atomic Robo. Get thee to Magna, just off the M1 near that big shopping centre outside Sheffield who’s name escapes me. Magna is an ex-Steel works. The first clue is the sheer size of the place. The second, as you drive into the car park, is the huge steel bull that used to stand guard at the side of the M1. Inside the massive, massive, shed you’re presented with 6 exhibits and a few side-attractions. The first of these side-attractions gets you playing music with some of the old kit in the place – a harp made from bungee cords that stretch up to the ceiling, some 60 feet above you, visualising the sound waves as you pluck and strum. A pendulum made from an old crane, knocking against tuned steel drums below you. And then you’re in to the elements. 4 zones, Earth, Air, Fire, and Water. You must journey through each of these zones, completing mental, physical, skill, or mystery challenges, to win crystals. Each crystal represents 5 seconds of time in the Crystal Maze… Sorry, distracted there. That show’s 25 years old! Man, they need to bring that back. In “Fire”, you’ll be shown how a forge works, witness – at really close quarters – a fire tornado, watch crystals melt. “Air” demonstrates sound, wind, actual tornados. “Earth” has diggers – actual JCB diggers you can drive! – mines, hydraulics. “Water” is the most interactive, hands-on, of the zones – water cannons, methods of lifting water (pumps, Archimedes’ screw, that kind of thing), a brilliant 3-rise loch system and boats. Definitely the kids’ favourite! And then there’s The Big Melt. A Yorkshire-accented voice talks you through the process of making steel from the raw materials, complete with son-et-lumiere and fireworks from the old furnace still in-situ. As an aside, you’ve seen this if you saw the last episode of the CBBC show “The Sparticle Mystery” recently. We had my dad with us, which tends to mean we cover the insides of these places at lightning speed – I’ll never forget the forced march we went on one day through “The Deep” at Hull. Arrived for opening time, out again long before lunch was even considered. But at Magna we’d gone mob-handed so someone was on hand to distract him with something new at all times. And the highlight of Magna? 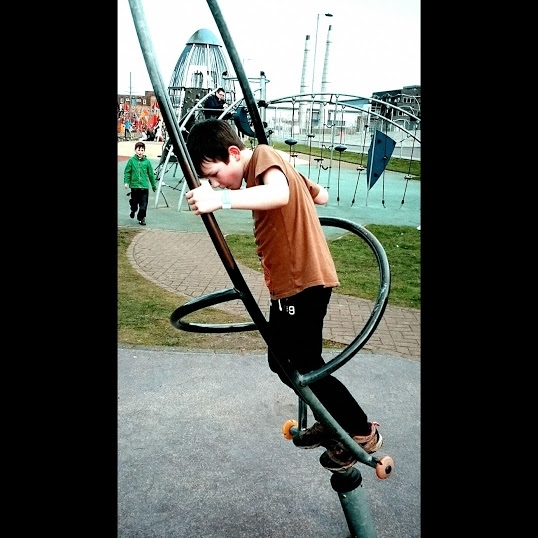 The playpark outside. Ranges from small sandpit-style stuff near the gates right through to big climbing and bouncing stuff at the far end. Definitely kept all the kids occupied for another hour, and the cafe inside Magna kept Dad supplied with tea through the day. Magna occupied us all for a good 4 or 5 hours, and we finished off at Brymoors’ for some ice cream. Whitby’s not far, in the grand scheme of things, from Masham. In fact it took us as long to get there as it did for all of us to get to Magna. Parking at the Abbey was free – and will remain so throughout the winter, charges coming back into effect at the end of March. Brilliant idea and one Rutland Water could do to emulate. Hell, the day we went to Rutland they should’ve been paying me to park up! 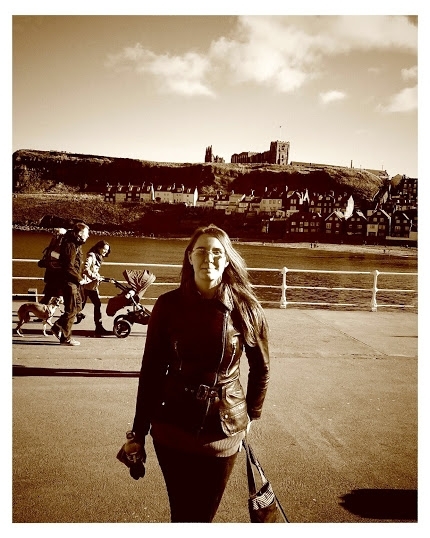 Things to do in Whitby. Well, the Abbey is the obvious place to start. Huge area of grounds to run around in, cracking visitor center – and with it being half-term, they had an Executioner and his Assistant telling tales and keeping everyone entertained on the hour, every hour. 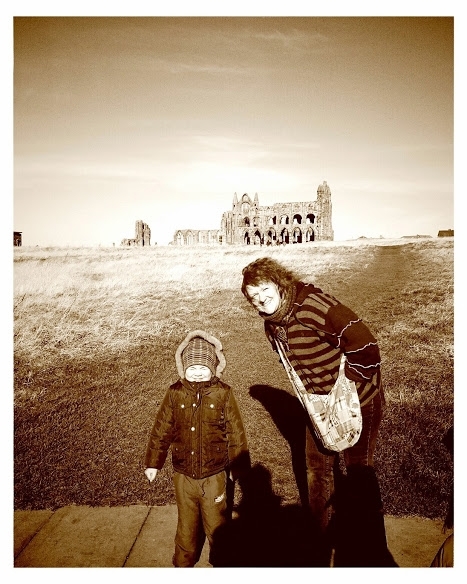 Whitby Abbey’s and English Heritage property, and when you’ve got 5 kids, having an English Heritage membership is nigh-on essential. Once you’ve run them all ragged at the Abbey, head down the endless stair into Whitby proper. As you’re going down the stairs you can gauge the queues in the fish and chip shops across the bay and work out which one you’re getting your fish from. Oh, and buy kippers. As long as it’s before half-two on a weekday (and probably earlier on a weekend), you can get really good kippers from a store that’s untroubled by technology. Take cash. Whenever you go to Whitby it’s going to be windy, so dress for an English Summer. I didn’t know Yorkshire had an Air Museum. It’s on the opposite side of York from Masham, so it’s a fair hike around the ring road to get there. Oh, and when they say “Immediate Right Turn” when you come off the roundabout, they mean immediate! I was following my dad in convoy and we both missed this turn! It’s basically a Yorkshire version of Duxford, built using the layout and, where possible, the buildings themselves, of the WW2 airfield on the site. There are several hangers of planes, a number of exhibits focussing on gunnery, bomber command, the regimental goat, etc. and a cinema (which was lovely and warm). The food is pretty good, and they’ve Black Sheep beer in the fridge. Not that it should be in the fridge, but it’s still good beer. Having been to both Duxford and now the Yorkshire Air Museum, I reckon the YAM is actually the better place to visit. For one, it’s smaller, so you can take everything in without being overwhelmed by the amazing tessellation of aircraft you get at Duxford (that space between the Lancaster and the Harrier is actually Concorde, for example). It’s not as well known, so the site was pretty quiet when we visited. 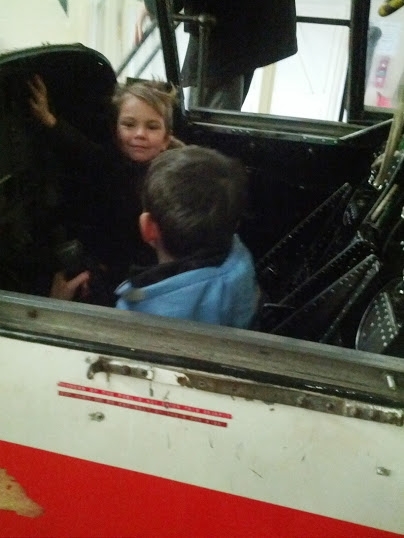 Thirdly, there’s a few more hands-on bits of actual plane for the kids to get into and have fun climbing on. No play-park with wooden Lancaster, mind you. Have I mentioned Brymoors yet? No? Well, head from Masham out into the depths of the moors. Drive towards the wonderful Jerveaux Abbey but just before the sharp right-hander that’ll get you down the hill there, go straight on down the farm lane towards the big, green, shed. Here you will find the most wonderful flavours of ice cream ever imagined. Toffee apple. Mango and banana. St Clements (oranges and lemons, obviously!) And the white chocolate sauce! Amazing. So good, we took a bottle of it home with us. Get there before 5 if you want a nice, warming, cup of tea to go with your ice cream. 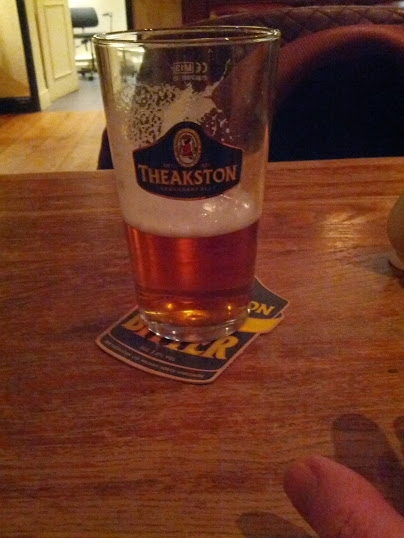 Other refreshments are available in Masham. So there you go. First off, before visiting Yorkshire, grab yourself an English Heritage family membership. There’s a wealth of stuff around the Masham area that you’ll be in to for nothing – we made our money back by visiting 2 properties. In a year. C’mon, you can do that, easy! Just think of all the knights and jousting you’ll see over the summer! Richmond Castle’s an absolute beast, so’s Middleham. There’s a ton of stuff that’s just not open this time of year – The Forbidden Corner’s my out and out favourite of those attractions – so you’ve a good excuse to come back in the summer. Food’s excellent – great fish and chips on the marketplace in Masham, the Black Sheep Bistro is always good and I ate at The Blue Lion for the first time this trip. Absolutely stunning food, great wine, superb location. Long story short, Yorkshire’s brilliant. And although I grew up in this area, the chance to do it as a visitor, to see things through the eyes of a tourist makes it even more special. Wonderful thing about the Scottish education system – and it may be one of the few things left – is that the school holidays are out of sync with the English ones. We all break up for summer 2 weeks before England. So it’s a cracking time to get out and about, see theme parks and stately homes while most of the kids are still in school. You do run the risk of being overrun with school parties but they’re usually only at one place for a short while. If you’re exploring the Midlands you could do a lot worse than the beautiful village of Pershore. 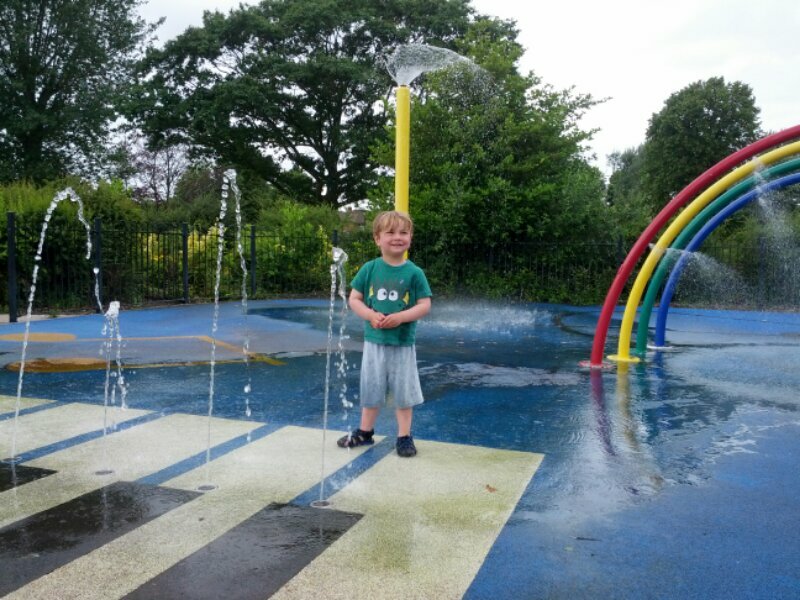 Lovely shops, stunningly pretty abbey and superb play park. Aside from a 2 day jaunt to Thorpe Park, everything we’ve done has been within an hour’s drive. 1 hour from Pershore will get you to a lot of places! Pershore itself. Tearooms, abbey, park, library, book, craft and toy shops. Asda, little Tesco, tourist information office (very helpful indeed). And tea shops! Tea shops that corrected us when we tried to buy Chelsea buns. Now Thomas’s bakers in North Yorkshire have been selling me Chelsea buns for years. I buy them whenever I’m in the area, always getting at least 1 more than I reckon I’ll need as I’ll usually polish one off strolling around Ripon before meandering back to the car. But it turns out these are Belgian buns with their icing and their cherry on top. Chelsea buns are a completely different beast! But the tea room happened to have a lot of Belgian buns as well so everyone went away happy. 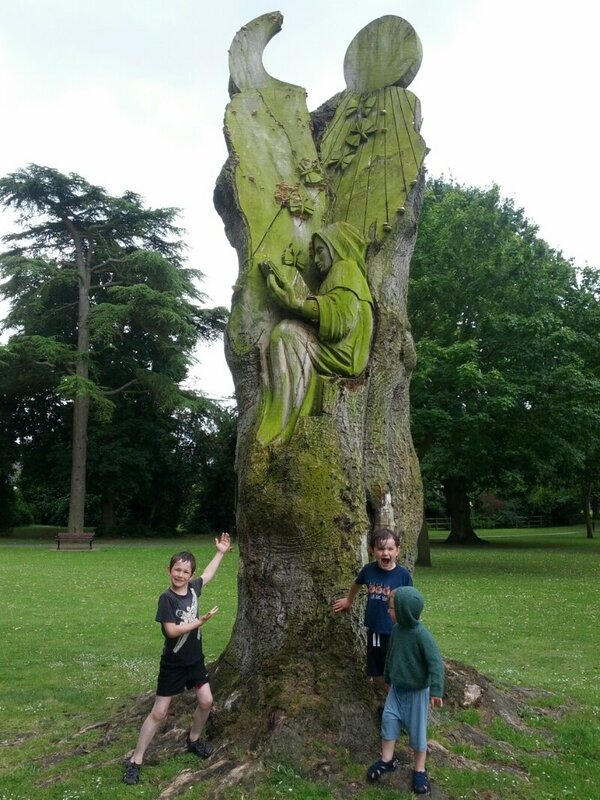 Tree carving in the grounds of Pershore Abbey. And on an entirely unrelated note, Worcester hospital does a cracking line in dealing with concussed kids when they fall off that rainbow arch. Not that that happened. At all. But if it did, the hospital is only 8 miles away. 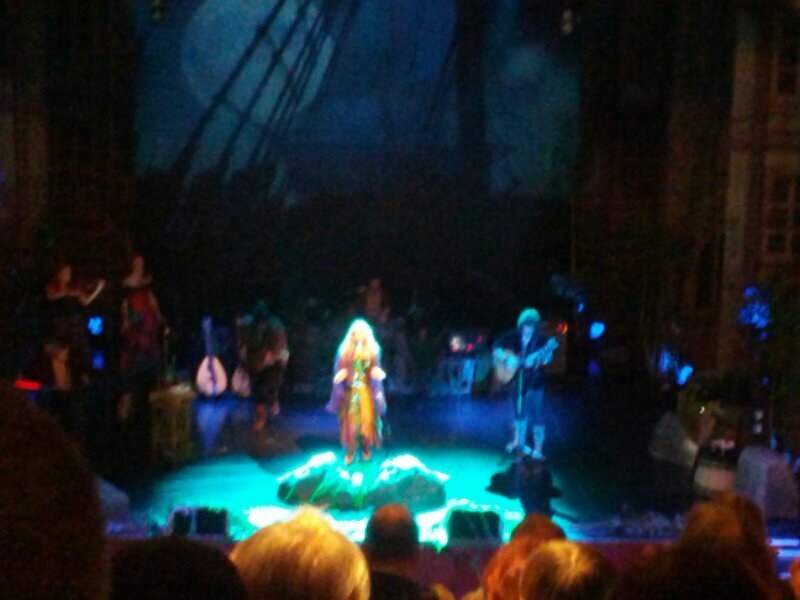 Alright, so Wolverhampton isn’t exactly a primo tourist destination but it did hold one thing we absolutely had to see: A theatre where Blackmore’s Night just happened to be visiting on their current “Dancer and the Moon” tour. For those of you unfamiliar with Blackmore’s Night, you might recognise the name Ritchie Blackmore as being ex of Deep Purple, Rainbow and a number of other bands. In fact it’s hard to identify a British rock band of any standing he’s not had some connection with, direct or indirect. Anyway, he discovered folk some time back in the late 90s and has been touring with the beautiful Candice Night and what can best be described as a bunch of assorted nutters ever since. Very talented nutters but the label sticks. Long story short, if you get the chance to see them perform, do so. They’re not doing this for the sole purpose of making money, that just seems to be a happy sideline. They’re doing this because they want to and they’re having fun. The gig introduced us to a rather interesting warm-up act – Wyndebagge – if you get the chance to see him perform with his only/just drummer Skin Tight, do so. Magical stuff indeed. Trip 2 – Stratford upon Avon. Home of Shakespeare. Royal Shakespeare Company performing As You Like It. Park & ride. Brilliant. Not a lot more to say as we didn’t spend a lot of time there – arrived half an hour before the performance, enough time to grab a sarnie from the Baguette Barge, and left straight after. 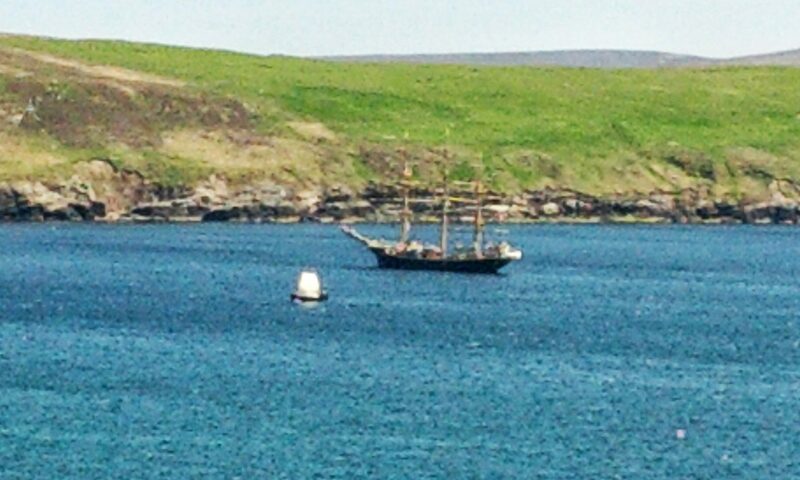 FULL of tourists! The Bar at the RSC theater was well priced considering they’ve got you trapped and the local beer was good. 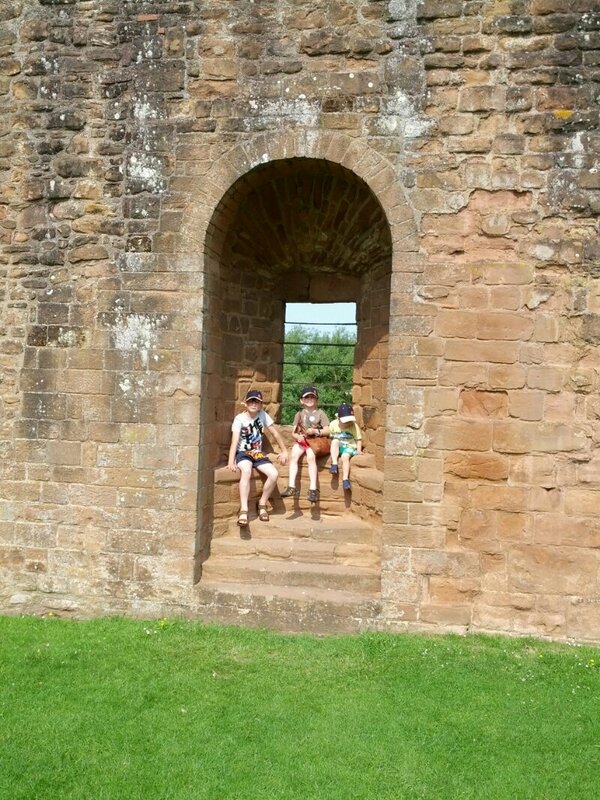 Trip 3 – Kenilworth Castle. Worth our English Heritage membership alone though the cafe was expensive and poorly stocked. Honestly, they start serving lunch at noon and only have 1 of the day’s special left by ten past! Plenty of exercise for all what with running around the inside of the castle then again around the outside of the walls. Such a shame it was on the wrong side during the Civil War. English Heritage are missing a trick, though – pin badges. I started collecting pin badges a year or so before we went to Disneyland Paris. I have a Roman coin from Vindolanda as my first, getting one from each place we visited if they had one I liked. Warwick Castle’s badge was rubbish and I didn’t get it. At Disneyland I got a badge for several of the rides I’d done – Space Mountain Mission 2 is my favourite badge, though the Tower of Terror beat it as a whole ride experience. I got a Tudor Rose at Kenilworth and that’s it! No EH badges with the little red # logo, nothing specific at any of their other properties. There are loads of collectors like me! Cadbury World had a good one, both the Theakstons and Black Sheep breweries had them! Seriously, EH, I’d be looking to get one for each property I visited. People have been visiting Kenilworth for years – and many have left their mark. One of the interesting games to play is “spot the graffiti” – eldest we managed to find was dated 1690. Trip 4 – Warwick Castle. Again, glad to be members of English Heritage! 50 percent off the entry fee not an insignificant amount! It’s part of the Tussauds group, so if you’ve got membership of that you’re golden. Good castle, very Ryanair in that everything beyond basic castle entry costs extra and parking is £6! Wide variety of decently priced eateries inside the grounds and good entertainments – the trebuchet is damn spectacular, the birds of prey beautiful and the fighting Knights make you cheer for the wrong side! Up the Yorkists! In the background here you can just see the trebuchet. This beast of a weapon stands some 40 feet tall and throws it’s ammunition as far as the yellow and red striped flag near this tree. They only fire it twice a day – in the morning with a normal cannonball, in the evening with a rather spectacular “fireball”. Better photo skills than mine are needed to capture the fireball! 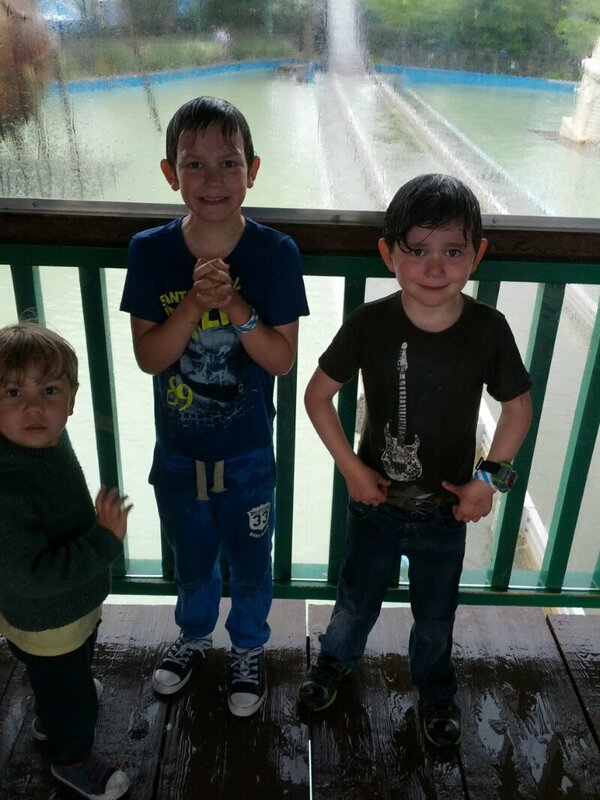 Thorpe Park… JFD. I’ve got kids from 3 to 13 and there were rides for all of them. As long as your youngest is 1m tall or over, you’ll be good to go. Pizza hut’s buffet is good value for an in-park restaurant and the crash pad hotel an inspired use of shipping containers! Yes, there were school groups roaming around but the time of year meant no really big queues. My only problems with the place were 1, lack of pin badges for my hat/bag. Only 1 badge for a single ride and I was too tall to ride that one! And that’s my other problem. I’m 2m tall. Not a giant, though my kids might beg to differ, and they’ve built a ride excluding everyone over 1.95m. Okay, so I don’t want to lose bits of my body but frankly it’s not fair. That aside, it’s an amazing place. Stealth is right up there as one of the best rides I’ve been on, Detonator not one I’d care to repeat (strange, as it’s remarkably similar to the Tower of Terror at Disneyland Paris and I loved that ride). The log flume hidden away in wild west zone is a real gem the whole family could do. And considering the quantity of rides it’s a compact park! Queueing for one ride will have the tracks of another swooping overhead. I didn’t get to ride Colossus, but you’ve got to leave a reason to go back! Be warned, “Tidal Wave” is likely to get you a little damp. We’ve had a picnic on a huge iron age hill fort in the Malverns, views over most of Wales and the Midlands. We’ve been tempted by the English Heritage app showing us Wayland’s Forge and Offa’s Dyke less than 50 miles away. We’ve had warmer weather than we would ever see in Shetland – better, even, than we had in Arles-sur-Tech last year. Base yourselves in Worcester, Pershore, Evesham and explore this area. National Trust and English Heritage memberships will pay for themselves in spades. I bet if you drew a 1-hour-travel circle around almost any location in the UK you’d hit just as many amazing things as we found around Pershore. And we only just scratched the surface. Actually, if you fancy a challenge this summer, draw the circle around your own home – 1 hour from where you’re sitting reading this post – and see how many places there are you’ve not been to.